Sara discusses what faith is, how we can build it, and how we can use it in our spiritual rebirth and spiritual growth. Faith is not something we see or hear, it is an indescribable feeling or belief that we have that strengthens our spiritual connection to God or Source. Everyone is at a different place with their faith and sometimes having faith can be hard. But by building our faith, we can raise our vibration so we can become one step closer to being more connected to God and to other people. 7:33- Sara gives some examples of how to build our own faith. By taking care of ourselves, by being kind to others, and by trusting the process, we can increase our “faith bubble.” And by having faith in ourselves, we can then have faith in other people.The more faith we can exude, the more we can inspire and affect everyone around us. 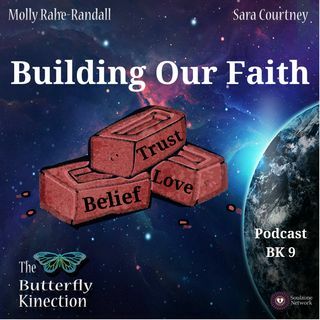 Sara talks about being a spiritual observer and how having faith and having our connection to Source allows us to believe that we can be kind, caring, and loving to other people. We are part of a higher network of energy and if we can see that energy in others, we can start to see what we can do for other people. How we build the relationships with ourselves, with God, and with the people allows us to expand our “faith bubble” outward to the world and beyond. And no matter where we are at in the process of building our faith, we are capable of spreading love and faith in a very powerful way.